Every great cook need all their tried & true recipes in one spot. This easel standing book holds 50-60 of your all time favorites. Each book comes with divider tabs giving you measure of your own important sections. If you love to create and no one can tear you out of the kitchen, or the to decide what to cook think one Recipe book for each category. Pass them around through your friends and family asking them for their masterpieces. Each easel back on every easel backed cookbook is handmade and covered in a variety of fabrics or handmade paper. These books are for the recipe collector, master creator, and those individuals who have creative friends who love to share the latest creation. Trade-ipes can hold over 200 recipes. Each section is divided with a storage envelope. When the prize winner for todays choice has been selected simply flip the trade-ipe around and snap it in place. Never to have sticky recipes again. Each comes with recipe cards(16) to add to you collection,, and divider tabs. Never write your name on the “From the kitchen of:” line again. 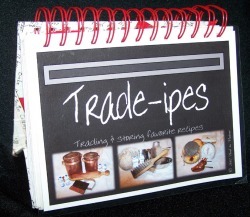 People will always know who the genius was they received that creation from… personalize you Trade-ipe recipe book with your name (i.e. Angelia becomes Angelia-ipe, Mark becomes Mark-ipe and so on). The entire book and extra recipe cards will have your name plastered all over them.